The doctors from various districts took out the rally — Bengaluru Chalo — requesting government not to pass the Karnataka Private Medical Establishments (Amendment) Bill, 2017. 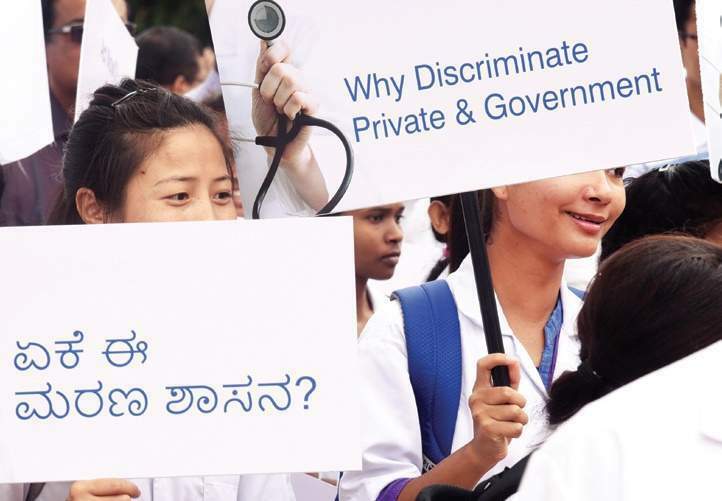 BENGALURU: A day after a delegation of private doctors met Chief Minister Siddaramaiah requesting him not to pass the Karnataka Private Medical Establishments (Amendment) Bill, 2017, in its present form, around 8,000 of their counterparts went on a strike protesting against the Bill, on Friday. The chief minister had not assured the doctors anything concrete on Thursday. The doctors, from various districts in Karnataka, including Bengaluru, took out the rally — Bengaluru Chalo — from the city railway station to the Freedom Park. Because of the strike, medical services were hit in parts of the state. However, the doctors claimed that the strike did not affect patients in Bengaluru. When the 30-member committee, headed by Justice Vikramjit Sen, announced its recommendations in April, public health activists went up in arms against the government as it proposed to include government hospitals. They wanted the two sectors to be regulated under different laws. Dr Nagendra Swamy, member of Private Hospitals and Nursing Homes Association, contended that it was unconstitutional for the government to fix prices for medical procedures. “A private clinic, a small hospital or a big hospital should be free to fix the price they want based on the skilled services they provide. When no other sector is regulated in terms of price, why is the healthcare sector singled out?” he said. The doctors also have a problem with the setting up of a district grievance redressal committee as per the Bill. “When there are so many fora such as Karnataka Medical Council, State Human Rights Commission, civil and criminal courts, why should they have another one? This is superfluous,” Swamy said. However, Karnataka Janarogya Chaluvali Convenor Akhila Vasan felt that the doctors’ fears were unfounded. “There will be classification for each hospital and clinic. Prices will be fixed based on that. And the committee that fixes the prices will have doctors from the private sector. The committee will have sub-committees that won’t fix prices arbitrarily,” Vasan said. As proposed in the Bill, a committee will be set up to fix price services and facilities like beds, operation theatre procedures, intensive care, ventilation, implants and consultation. It will have members from both private and government sectors. Among city hospitals, Vikram Hospital was one whose doctors and staff participated in the protest. “We, keeping in view the requirement and to avoid inconvenience to patient care, emergency, walk-in and in-patient services, have been maintaining the above services with skeletal staff,” a statement from the hospital said.